Do you feel terrific after you shower ??? Do you feel confident that the water that cascades down your body is the best available ??? If you have not yet experienced the spa quality mineral shower that the Anespa provides, you are really missing out. 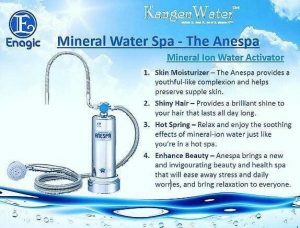 Enagic, the Kangen Water company, created the Anespa so that each of us could have a great shower experience each and every day. The only moving parts in this device IS THE WATER. There is a ceramic cartridge, a filter, and the base is the magnet that helps to create the ionization of the water – BOOM !!! Research on my website and place your order so you and your family can begin enjoying the dynamic benefits of the Anespa DX. The time for better health and wellness starts TODAY.